Brick and mortar stores have the ability to surprise and delight. So does a downtown shopping area. The sheer serendipity of walking into a store can present you with random points of view. Couple that with a retail crew trained in the soft skills of how to engage a stranger and you’ve created an engaging shopping experience. Jeff Bezos said it best: "We don’t make money when we sell things. We make money when we help customers make purchase decisions." And that’s true for both online and brick and mortar retailers, right? So what’s online’s Achilles heel? People only buy what they came to the site to buy, and if you’re an apparel retailer, half of them will be returned. And serendipity leads to higher sales. The question is, when does this become the tipping point where shoppers return to physical stores? Humans love the random discovery of something new or unexpected. No algorithm can predict what that item will be or when you personally will be ready for it. But that doesn’t stop them from trying. Customer engagement is all the rage in marketing circles. Customer engagement is a connection between a retail sales associate as a representative of the brand and a potential customer. How you manage that retail customer service interaction makes all the difference. Many pundits are touting how to really engage a shopper; we are to bring all of the resources of Big Data to brick and mortar retailers. But does that mean for example that a salesperson is supposed to grab a shopper in the underwear aisle and haul them to the cookware display because Big Data shows they bought a frying pan at the same time they purchased a pair of underwear? Does the kitchenware associate grab a frying pan and run to the customer in the underwear aisle? Further, will the salesperson who knows your browsing history charge you more like online retailers? Right now the online shopper has the blind belief online retailers are on their side and brick and mortar aren’t to be trusted for low prices. In fact, 71% of shoppers believe they will get a better deal online than in stores. Checkout my recent price check of a vacuum cleaner on Amazon and the price fluctuations that one product has had over the past 30 days. How do you compete with that? Well first off-whenever someone states the online price is always lower - challenge them. That said, you can’t feasibly change all your prices by week, or month, or hour nor can you charge more for the woman who drove a new BMW to your store versus the guy who rode a bike, but conceivably you could online. Who has the time or the budget? Oh right, online retailers have the technology that can do that in nanoseconds. Your poor website hasn’t got a chance if you think you can compete on price. And in-store, the less you train your crew, the more price-driven you will become. But because you aren’t adjusting prices in nanoseconds, you’ll probably be charging less than you should. The less profits you make, the less you can reinvest in inventory, merchandising, training and even yes, Big Data. Retail is not dead, but brands are dying. Scott Galloway from NYU Stern School of Business says, “Amazon has declared war — with the backing of 500 million consumers and a lot of cheap capital — on brands. And we will, using our algorithm, find you as good a product for a lesser price. Amazon will figure out in a nanosecond the best deal and most likely trade you into the highest-margin product for them which will be Amazon toothpaste." You’d think customer engagement would be a priority in brick and mortar stores right now, right? I was strolling Michigan Avenue in Chicago last month. While most store employees couldn’t say a word to shoppers, there were a few who tried. I thought, Get away from me, it’s not the 1800s. Customer engagement is finding a new way to get strangers to talk to me. Yes, they were trying. I mean, at least they were using their voices. When I went into Macy’s, I saw they were trying at customer engagement too. 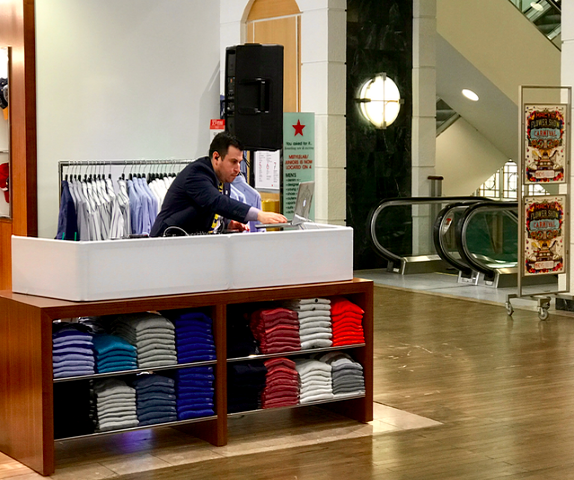 They had a DJ in the men’s shirt display unit – with no one around. Meanwhile, I walked through all of their men’s departments and passed their leftover sale clothes, and no one approached me. As an aside, one of my Facebook fans, Shawn Fitzpatrick, reported an experiment regarding in-store music. Their retail bicycle store stopped playing the music staff liked to listen to and swapped it for "feel good" music like Brown Eyed Girl, Sweet Caroline, and Friends in Low Places using an online music service. They reported a 40% increase in sales over previous week. Seems there might be something to it. While I was on the second floor of the Under Armour shop, a guy entered the golf simulator to swing a ball at a virtual course. Alone, he tried to figure out how to use it. I watched for five minutes and he stayed alone. That’s the best engagement those retailers could come up with? The most common complaint we still see in survey after survey of shopper pet peeves is “No one said a word to me, “Not enough employees to get waited on properly” or disengaged employees who do not want to serve anyone other than their phone. That’s because we have an army of retail workers who have become mute. That’s why you need to give your employees training so they get their own voices back. Once they do, they can become trusted advisors to shoppers. Because online retailers are now beginning to use technology to try to get you to trust them. The new Amazon Echo Look will now store pictures of you in your wardrobe and make recommendations for you. The app will provide an opinion based on criteria including fit, color, styling, and current fashion trends. All of the information being collected will also be used to help in providing future purchasing suggestions. That’s pretty close to becoming a trusted advisor. And that’s pretty close to customer engagement. But it still doesn’t add the magic of serendipity. And if brick and mortar retailers don’t use their advantage of unexpected purchases, what happens? They’ll squander their one big advantage and profits will suffer. What is it going to take you to get serious about your own customer engagement that leads to serendipitous sales? Why should a shopper put more effort into shopping than you the merchant puts into creating a memorable – and by that I mean exceptional – experience? They shouldn’t. But you should. See also, What Do Shoppers Value and Want When They Walk Into Retail Stores? The way forward in retail will be a combination of stores and online to optimize the shopping experience and retain customers. Scores of retailers are going to close – but it doesn’t have to be you. You have to up your service game or you’re going to lose the game of retail. Retail sales training is still uncharted territory for many retailers. They just don’t value putting money into the one physical thing that can most juice their sales - their employees. Because of poor customer service and engagement in stores and online shopping’s endless aisles of products, shopping has been turned into just choosing things to use. Not new and different, but more of the same. When the experience is as bland and boring as I had on Michigan Avenue, more and more shoppers will just let an algorithm choose. And that’s a really sorry state of the future. Take action. Hunker down. It’s going to be a bumpy ride. Do what it takes now to get it done. If you’re serious to compete in all of this chaos, let this post alert you to the real risks in retail right now. You have to focus on what the real problem is in your stores so you can fix them, rather than trying to treat the side effects. I have a white paper that can help you, Bricks and Mortar Retailing at Risk in the Digital Age—From Silicon Valley to Main Street. I call it my Manifesto because it sums up everything I believe is wrong with retail today (with some more figures to back it up), and how it can be fixed. PORTLAND, Ore. (BRAIN) — After six years in its Pearl District location here, Western Bikeworks COO Mike Urness decided it was time to modernize the 10,000-square-foot store in order to up its retail game and deliver the upscale shopping experience Portland shoppers have come to expect. Urness worked with retail design firm 3 Dots Design to update the shop's interior. “We are just finishing the redesign and build-out of our downtown Portland store and 3 Dots was a huge help — from pulling the store design and layout together to helping us select materials, fixtures and mannequins and then connecting us with excellent suppliers and helping with negotiations, pricing and logistics,” Urness said. The remodel included carving out a triathlon-specific zone to house tri apparel, accessories, wetsuits and a complete offering of tri bikes. The tri section is located right near the bike fit area, so that high-end triathletes can easily dial in their perfect bike fit. Western Bikeworks recently acquired rights to triathlon retailer The Athlete's Lounge's name and customer base after it closed in 2016. “This was an exciting project for us to work on, as Portland has some of the best retail stores in the country. This shop suffered from many of the same challenges that typical shops deal with; confusing sightlines, overwhelming bike presentation, uninspiring apparel sections and lack of signage or graphics,” said 3 Dots Design owner Holly Wiese. “I think customers will be very pleasantly surprised with the new vibe and layout of the store, and I’m confident that Western Bikeworks will start selling more product as well,” Wiese added. 3 Dots Design also reorganized the nutrition category and segmented the store's bike selection to make it easier for customers to shop. Western Bikeworks also operates a second location in the Portland suburb of Tigard, which it opened in 2015. Urness said he plans to integrate some of the same principles of merchandising, graphics and signage from their main location remodel into the Tigard store. Sleepy Pearl Street shoppers can take themselves to one of downtown Boulder's dozen-plus coffee shops for a cup of joe. Or they could dash into Rapha, a cycling apparel store. In need of a taco and a new bike tire in Longmont? CyclHOPS Mexican Bike Cantina has got you covered. Or put some pep in your step via an espresso and a pair of shoes at Flatirons Running. These local retailers and others have hopped on the hottest trend in retail by offering food and drink to keep customers in the store and off online shopping sites. "There's so much pressure on brick and mortar to differentiate from the Amazons of the world," said Russell Chandler, owner of Boulder-based Full Cycle. "Anybody can buy a high-end road bike online; you can go find a mobile repair shop. Shops run the risk of going out of business if they don't find ways to build more community." Full Cycle is in the process of adding a 16-tap beer, wine and coffee bar to its downtown digs (1795 Pearl St.) which it hopes to have open in the coming weeks. Chandler sees it as a way to bring in more bodies and, hopefully, boost revenue. "We host a 200-person women's bike club that might like to finish their ride up with snacks and beer," he said. "And we rent a lot of bikes to tourists who might want to sit down for a drink when they're done." Rapha, a cycling apparel store that just moved in up the street (1815 Pearl St.), has "ended up being more of a hangout than a store," according to General Manager Pete Loptino. "People can look at their product if they're interested, but it's more about the culture of cycling." In addition to the coffee bar, Rapha has a flat-screen TV that will always have a cycling race on it and hosts regular social rides that leave from the store. It's part of building an experience that turns shopping into "more of a social event," said Holly Wiese. Wiese is a retail specialist at 3 Dots Design, a Boulder firm that specializes in store re-designs that boost profits. More and more lately, that includes adding coffee or sandwiches. "Over the last three to five years, we've seen it popping up all over in bike, run and outdoor." According to Ginsborg — who develops shopping centers, including Longmont's Village at the Peaks — nail and hair salons are getting in on the game, too, offering wine and beer to customers. "It's about creating an experience, an environment where people want to linger," he said. "Customers have higher expectations these days; you need to provide something that makes them want to return." That's particularly important as options for shoppers proliferate online. Internet retailers, dominated by Amazon, added $27.8 billion in apparel revenue alone between 2005 and 2016, according to Morgan Stanley. Department stores during that time lost $29.6 billion in apparel revenue, and major retailers from Macy's to Best Buy are closing dozens of stores. Making physical shopping more efficient is the key, said Chad Melis of Oskar Blues, which operates Longmont bike shop/taco joint/bar CyclHOPS. By offering more than one service, customers can accomplish multiple tasks at once and reduce their trips. "You kill two birds with one stone — you come in and drop off your bike to get some work and you can have lunch." "It takes a little creativity" from a business standpoint, he added, "but combining revenue streams makes the concept healthier financially." Tacos and beer haven't necessarily boosted revenue for the bike shop: Melis sees it more as a marketing play for Oskar Blues' bike line REEB Cycles, a way to "show who we are and what we contribute to Longmont's culture." The local trend is new enough that it's not clear if the effort is boosting sales, though Wiese says her cafe-adding clients in other states have seen a bump. But Full Cycle's Chandler is hopeful that when the brews start flowing, the cash will follow. "You just test-rode an $8,000 mountain bike, you sit down and have a beer — you might talk yourself into buying it."